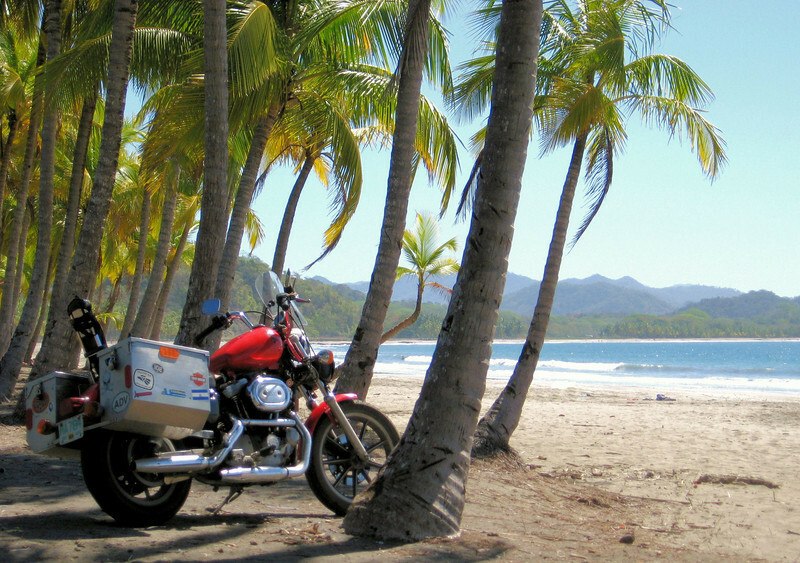 Playas del Coco: The bike and us are ready to go by 7:00 AM, other people are up and milling about the beach area also. The roads leading here are in good shape so the hope is for more of that as we ride south. 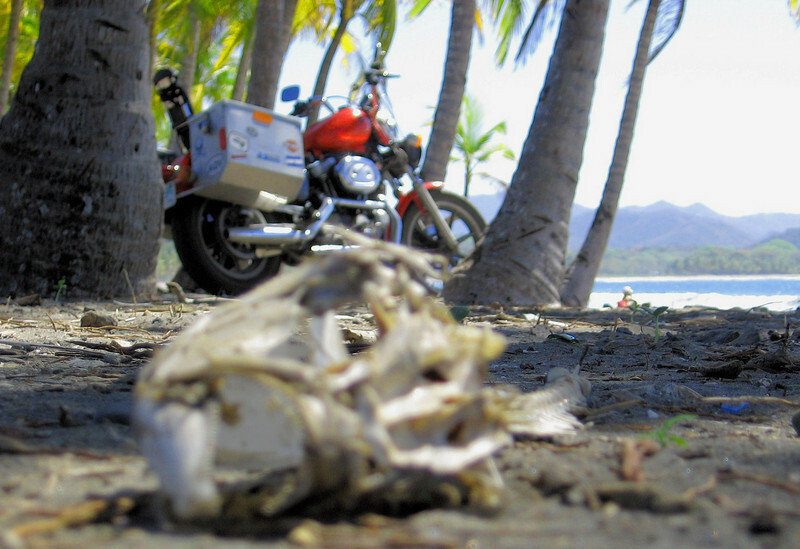 Following the road south along the Pacific coast we decided to skip the beach village Tamarindo. The decision is easy, reports of Tamarindo being crowded and over priced is one thing but most of all the beach lost it’s ‘blue flag’ status meaning the water is too polluted. Not the kind of beach I envision running into and taking a nice long swim. 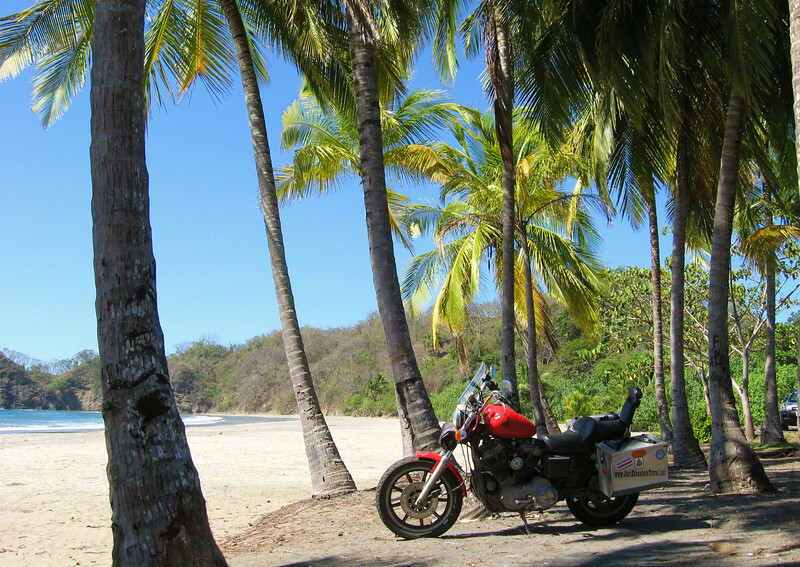 There are lots of clean and less crowded beaches in Costa Rica further south. We ride on. The roads south of Coco are in OK condition but has a lot of bumpy sections, at least no giant potholes. 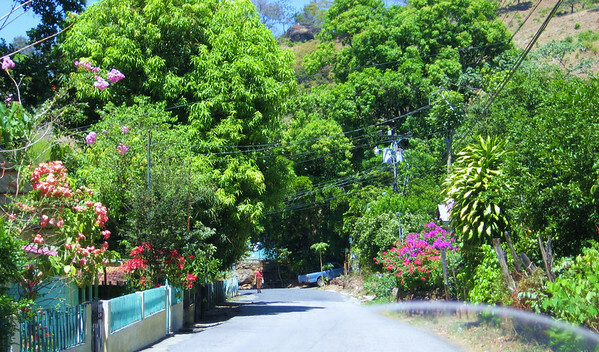 Twists and turns through hills and jungles, what’s not to like. At the National Bank in Nicoya I try to get some cash from an ATM. Primary card, first backup card, second backup card, all fail to give me cash. This is nothing new, most of the ATM’s in Central America have a mind of their own. I do a U-turn and ride toward the center of town. Not too far into town is another bank where I recognize The ATM logo as being one that has worked in the past. Primary card works and first backup card works, we are ready to proceed. We may have a big daily limit on our card back home but all ATM’s south of the border have a max withdrawal that is much less. But sometimes we have maxed out, and then try it again and sometimes more cash. I get cash from 2 cards this time to verify they still both work. It’s part of the operation: ‘We must periodically test and verify all mission critical systems’. Base camp is setup. We are now prepared to explore the country. Heidi and I are talking about what month we should ‘be in’ South America. We are concerned that if we wait for the ideal season we won’t have enough time for the continent. This means our time in Costa Rica is limited. We give ourselves 30 more days to here. Our ‘central america on a shoestring’ guide book is under half its original size and weight after ripping out everything except Costa Rica and Panama. All old paperwork from other countries are threw out. Our two camping fuel bottles and world-camp stove are getting off-loaded here. We both gave away some good clothes and a couple of nick-knacks to a maid we made friends with in Nicaragua. We are carrying less water now because we don’t plan to camp for awhile. I will look over my sockets, maybe a wrench or two can go, I’ll have to experiment. As the bike continues to get lighter I can feel the vibration in my soul. I know we will make it. Heidi doesn’t want me to get too cocky and I agree, we must stay vigilant, but the taste is still there. 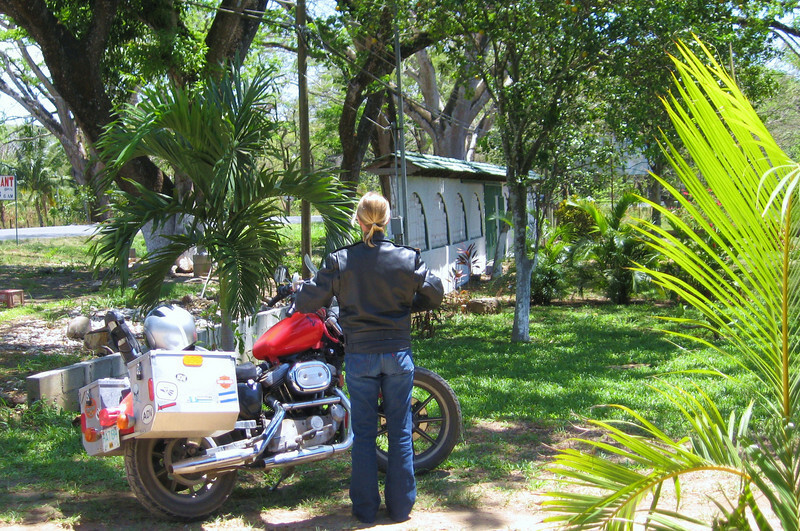 One country away from Panama, then just a 2 hour plan ride to South America. 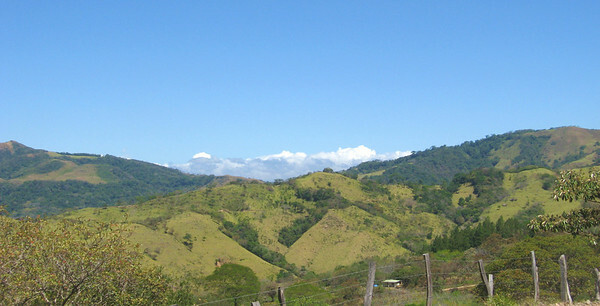 In the higher elevation rain forest near Monteverde are some of the best nature parks. A day is devoted to some hiking if it can be ridden 2-up. We have the “National Geographic Adventure map” of Costa Rica and it is an extremely detailed map. But that’s not always a good thing. We will see. We are on the road early while it is still cool, perfect for riding. 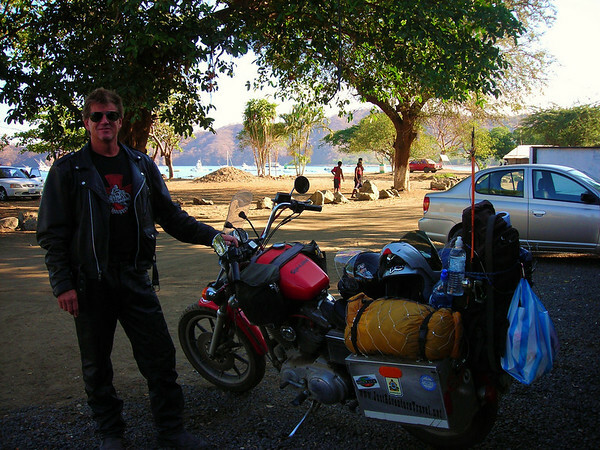 The ride is on the bumpy, hilly and twisty jungle road toward the mainland, “Can Do” I say to myself. The bike is down to bare bones. All we are carrying are tooth brushes, hiking shoes, shorts and a T-shirt plus ‘All the Tools”. The bike almost feels like a toy. I tell Heidi that even with her on it feels like a toy. She likes that…..
We pass a few ‘sweet beaches’ on our way from base-camp. Riding along the Pacific coast here is incredible. 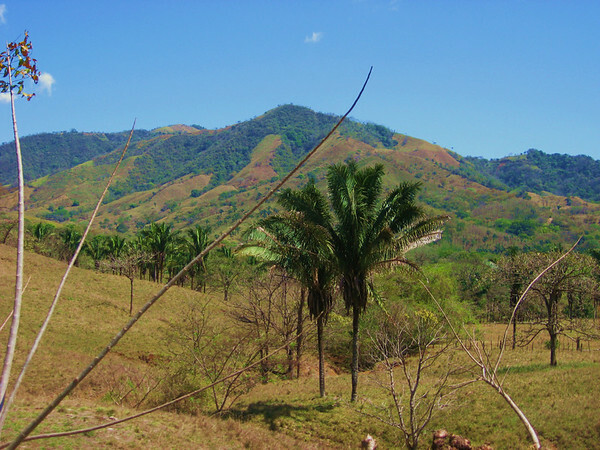 The deforestation is surprising while we start getting inland, but still a scenic ride. The plan is to take a ferry after the fork in the road a few miles before the river. On the road to the ferry a guy in a pickup truck waves to us and points us down the other road. He was trying to let us know the bridge is done, that is the way to go. Our map shows a ‘future bridge’. I discuss the situation with Heidi, we proceed on with confidence the direction the truck pointed us. The bridge El Puente de Amistad de Taiwan was built and financed by Taiwan, with help from Costa Rican engineers and workers. 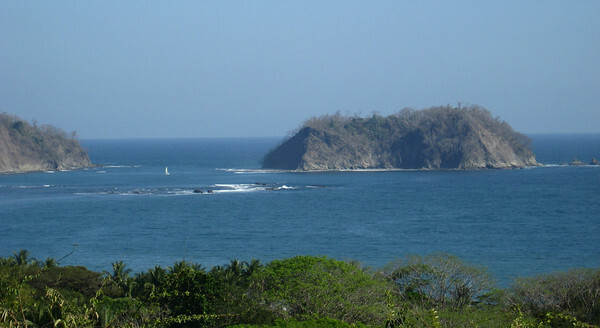 It’s in the province of Guanacaste and crosses the Tempisque River. The road is getting steep now and is down to the width of one decent US vehicle lane. I have to keep a close lookout for those big trucks coming down fast and taking up the whole road around turns. The bigger guy always wins. The road turns to rock and big stones. The map shows we just hit a border of a steep protected area. We may have about 11 miles of this before Monteverde. The secondary roads on the map all look the same. It may be paved, it may not. Steep and steeper, I’m dodging huge boulders and gullies. I actually had to come to a complete stop and clutch it to get going again. An SUV was coming down and we were skipping from side to side in big ruts. I get a jab from Heidi meaning ‘try to stop soon’. I find a flat spot. Heidi said she just needed to catch her breath. The road gets worse. I find the closest thing to a flat spot and have a chat with my partner. I say “We tried” Heidi agrees. 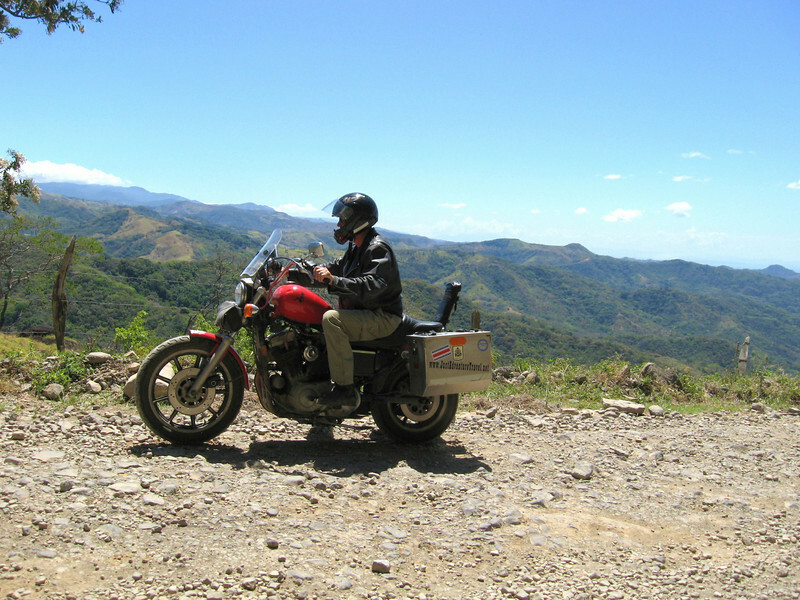 We know there is an easier but longer way to get to Monteverde. We will try another day. This was still a nice ride. We turn it around. I’m glad I like off-road riding……. We passed several small communities on our ride today. Several have ‘open air’ restaurants that are alongside the road. On the way back we pick a cross-roads area that had a lot of big trucks parked. 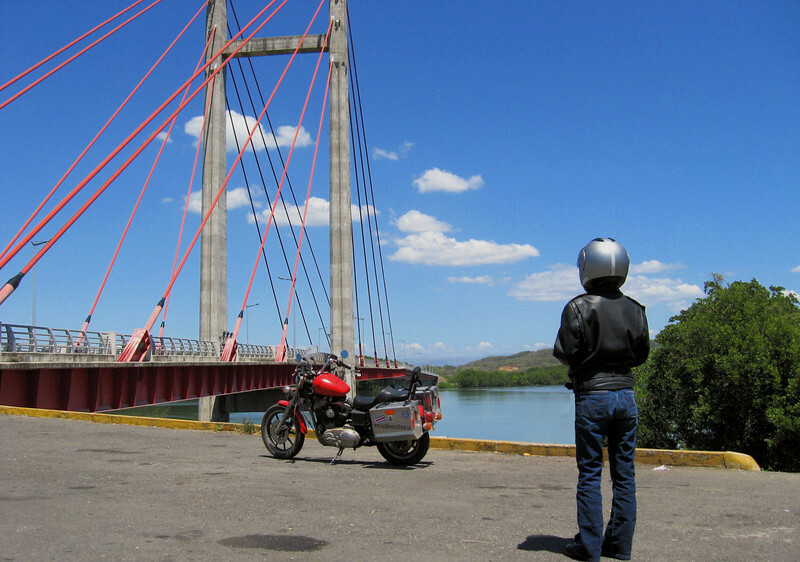 The Pan-American Highway comes though here. The food was good, the chillin’ was good. Sometimes are most enjoyable rides are ones that don’t go according to plan.